Apparently publishers don’t think too highly of the digital ad industry’s monetization offerings -- or of their own. 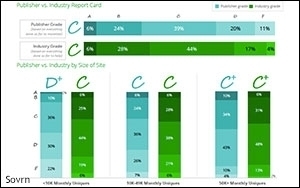 A recent research report found that most publishers gave themselves (and the industry) a “C” grade when it came to effective monetization of content. The report, dubbed the Publisher Roundtable, comes from Sovrn, Viglink and research firm Netpop. Only 6% of publishers gave themselves an “A” for monetization efforts, with about one-quarter (24%) grading out at “B” level. Nearly one-third (31%) gave themselves “D” or “F” grades, while the remaining 39% pitched themselves as average -- “C” level. "We believe that the majority of publishers are finding that monetization is slower, harder and lower than expected because they don't have true insight on the value of their readers,” Walter Knapp, CEO of sovrn Holding, a programmatic supply-side platform (SSP). Nearly half of respondents said they are finding monetization to be slower, harder and lower than expected. Several documented reports recently have demonstrated the divide between what marketers want to do and what they actually do. However, I wouldn’t say the harsh grades publishers gave themselves in this “Publisher Roundtable” are a bad thing; critical self-examination should be applauded, and is likely required to push the digital ad industry -- particularly the programmatic side -- out of a “quality” rut as it makes a case for brand dollars.